The Nigerian White Rice and Stew is a popular Nigerian rice recipe because it lets you eat rice with any stew or sauce of your choice. This rice recipe is usually eaten with Beef and/or Chicken Stew which we almost always have in the freezer so it is just a matter of boiling white rice. So if you already have Beef/Chicken Stew in your freezer, the Boiled White Rice and Stew will be one easy dinner recipe to make if you are tired after a long busy day. Cooking white rice is as easy as boiling eggs for breakfast. It is usually cooked plain with no added ingredients. Some people add salt but this is optional. This procedure applies to the long grain white rice. Parboil the rice using the method detailed in How to Parboil Rice for Cooking White Rice. You may want to parboil it for much longer depending on personal preference. Pour the rice in a sieve to drain out the hot water. Dip in cold water, then wash and drain. Meanwhile set some water to boil in a pot big enough to accommodate the rice bearing in mind that the rice will rise some more. 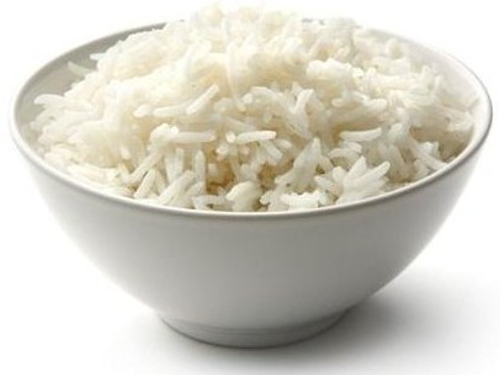 The extent of rising depends on the type of rice and for how long it was parboiled. Add the parboiled rice and salt (optional). Check to see that the water level is just about the same as the rice. Cook till the water is just about drying up. Check that the rice is done. If not, add more water and keep cooking. Keep checking till the rice is done. Leave to dry completely. This is usually confirmed by a ticking sound coming from the pot. Eat with Meatball Stew, Beef and Chicken Stew, Banga Stew (Ofe Akwu), Vegetable Sauce, Pepper Soup, Mixed Vegetables Curry Sauce or even Egusi Soup. Boiled White Rice and Stew accessories include: Fried Plantain, Nigerian Moi Moi and other Nigerian Rice Accessories.